Designed for maximum versatility and performance capabilities, the short sleeve T-shirt from FALKE forms a high quality, ergonomic sport system with multi-functionality. 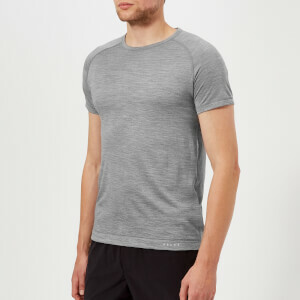 Constructed from a premium, natural merino wool and silk blend, the fitness tee features a two-layer structure to maintain body temperature whatever the climate or activity, with wool keeping you warm in cold temperatures and silk keeping you cool in hot weather. Comprising a round neckline and short sleeves, the piece is ideal as a base layer with odour-neutralising properties and a comfortable fit for maximum flexibility during training. Flatlock stitching features throughout to minimise chafing and the style is complete with a FALKE logo to the hem.